Is your leadership engaged in environmental stewardship? Does your facility have a foundation for a long term commitment to sustainability programming? If you left, would your programming cease to exist? What is the role of leadership in environmental stewardship programming? What does an engaged leader look like? Join us for this call to find out! Join Blair Sadler, Senior Fellow of IHI and former CEO of Rady Children’s Hospital who will moderate a discussion with Tim Jones, President and CEO of Northern Berkshire Healthcare, Scott Kashman, Chief Administrative Officer of Cape Coral Hospital and Jeff Thompson, MD, Chief Executive Officer of Gundersen Health. 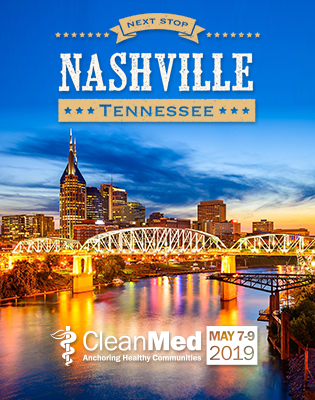 These leaders talk, walk and envision a healthier future and firmly understand, realize and act upon environmental improvement opportunities that benefit their staff, patients, communities and the bottom line. They recognize their role as leaders in creating a culture of possibilities. During this call they will share their personal reasons for engagement, their successes, future plans and answer questions. Bring your leadership, your challenges, and your questions and join the conversation. Jeffrey E. Thompson, MD, is chief executive officer and chairman of the boards of Gundersen Health System, and a practicing pediatric intensivist and neonatologist. He is a founding member and past board chair of the Wisconsin Collaborative for Healthcare Quality. Presently, he is chairman of the board of the La Crosse Medical Health Science Consortium. Since completing his professional training in 1984, Dr. Thompson has worked full time solely at Gundersen Clinic and Lutheran Hospital – La Crosse (now Gundersen Lutheran). From 1992 to 1996, he served on the former Board of Directors of Gundersen Clinic and played a key role in the negotiations and governance design that led up to the merger between Gundersen Clinic and Lutheran Health System. Since 1996, Dr. Thompson has been a member of the Board of Governors, and a member of the Board of Trustees. He served as executive vice president from 1995 to 2001. From 2001 to present he has served as chief executive officer. Dr. Thompson is board certified in Pediatric Critical Care, Neonatal and Perinatal Medicine, and Pediatrics. He finished his Neonatal fellowship at Upstate Medical Center in Syracuse, N.Y., in 1984. He was a Pediatric resident, and then Chief resident from 1979 to 1982 at the same institution. He completed his Pediatric internship at the University of California-Davis from 1978 to 1979. Dr. Thompson graduated iN 1978 from the University of Wisconsin-Madison Medical School. He is a member of the American Academy of Pediatrics as well as their subsections in Neonatal and Critical Care Medicine and is a member of American College of Physician Executives. Dr. Thompson has authored a number of articles, book chapters and abstracts on many healthcare topics. "At Gundersen Health System, we believe healthcare organizations need to be honest with themselves and look in the mirror when it comes to environmental factors that affect human disease. We need to come out of the clinic and hospital walls and be partners in the health of the community . . . not just care for the sick." Scott serves as the Chief Administrator Officer of Cape Coral Hospital, part of Lee Memorial Health System with system responsibility for Radiology and the system’s two medically based wellness & fitness centers. Prior to Cape Coral, he served as the Chief Executive Officer with Ascension Health’s St. Joseph Medical Center, a 310 bed medical center in Kansas City and Chief Operating Officer with Mercy Hospital Anderson in Cincinnati, part of Mercy Health Partners. He also held executive roles with Rehabilitation Institute of Chicago, University Hospitals of Cleveland and Charity Hospital in New Orleans. Scott worked as a psychiatric counselor for five years before going into healthcare management. He published several leadership articles and completed a year long Ethics Fellowship with Northwestern University Medical School. Scott received his Masters of Healthcare Administration from Tulane University and his undergraduate degree from University of Pittsburgh in Pennsylvania. He is a Fellow with the American College of Healthcare Executives (ACHE) and a Certified Personal Trainer through the National Academy of Sports Medicine (NASM). Tim Jones joined Northern Berkshire Healthcare as its President and Chief Executive Officer in October 2012. He is responsible for leading the organization into the world of Accountable Care Organizations while continuing to provide superior care to a rural community of 40,000 people. The organization has two primary focuses: safety first and creating healthier communities. NBH includes a full-service community hospital founded in 1885 and a visiting nurse group that recently marked 100 years of service. Mr. Jones has been a healthcare professional for 25 years in both acute care and ambulatory settings. His career reflects both clinical experience as a Radiation therapist, as well as progressive leadership experience in various settings. Before joining Northern Berkshire Healthcare, Mr. Jones was the Chief Operating Officer/ Administrator for the Vanguard Health System at Metro West Medical Center in Natick. He has significant experience in business development and leadership, physician relations, team facilitation and fiscal management. Mr. Jones is highly regarded for introducing Lean Healthcare to the Vanguard Health System and MetroWest Medical Center. Lean is the organization’s management strategy and has contributed to significant improvements in patient safety and quality, staff engagement, and return on investment. Mr. Jones presented a keynote lecture on Lean Healthcare at the World Healthcare Congress Leadership Summit in July 2010 among other national conferences including Practice Greenhealth and CleanMed. Most recently Mr. Jones was the keynote speaker for the 2013 Symposium on Sustainability in Healthcare in Dayton Ohio. He is also a certified facilitator in the Juran Quality methods. Mr. Jones was awarded a Master of Business Administration from California State University and a Bachelor of Science degree from California State University. He also holds an Associate degree in Radiation therapy. Sustainability: Trend or Long-standing Movement? Sneak Preview: Green Employee Benefits!